1 August 2008: The majestic Pittsburgh City-County Building, erected in the early part of the last century, now houses the city’s 26-year-old mayor  its youngest ever. Located at 414 Grant Street, between Forbes Avenue and 4th Avenue, it is the seat of government for the City of Pittsburgh and houses both Pittsburgh and the neighboring Allegheny County offices. The two governing bodies are represented in the design of the elevator doors, which are cast with depictions of earlier city halls and courthouses throughout Pittsburgh's history. Before 1907 Pittsburgh and Allegheny were two cities, with both central business districts across the Allegheny River. The absorption of Allegheny began in 1906, authorized by the Supreme Court and finally approved by the United States Government in 1911. After the cities merged, Pittsburgh decided to build a new city hall in collaboration with the County of Allegheny. Today this distinguished building is known as the City-County Building. Such city-county building collaborations are rare in the United States but not unknown. The 44-metre high ten-storey building is to be found in the Pittsburgh government district of the Golden Triangle Central Business District. The City-County Building was built in the classical revival style and was designed by Henry Hornbostel, who greatly influenced the architectural environment of Pittsburgh. The main hall is surrounded by gilded classical columns supporting a vaulted blue and white stencilled ceiling of terra cotta tiles. In the front facade of the building there are three huge arches. 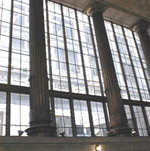 Light breaks in through tall windows and the pedestrian corridors provide a clear view of the grand lobby. The work of art entitled ‘Steel Cityscape’, designed by Aaronel de Roy Gruber, is located at the City-County building portico facing Grant Street. This abstract piece, composed of varying purplish-pink square forms creates an illusion of explosion, expansion, and growth that symbolize the strength of the city. The piece of painted steel was designed specifically for its location. It is one of the three prize-winning works from the 1976 Society of Sculptors Show entitled ‘Sites, Public and Private’, which provided for the completion and installation of winning works in sculpture-specified locations in the city. Over a side entrance to the building there is the inscription PROTHONOTARY. It became famous when President Harry S. Truman paused on coming across it during a visit to Pittsburgh in 1948 and is said to have exclaimed: “What the hell is a prothonotary?" Truman is also attributed with declaring that "prothonotary" was the most impressive-sounding political title in the United States. Actually, a prothonotary is the chief court clerk in certain courts of law.